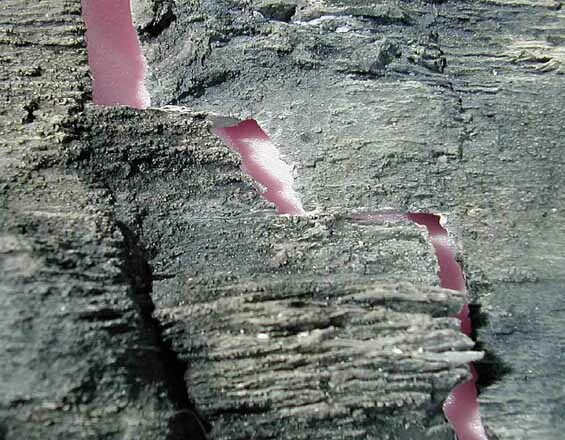 Description: Here's a close-up of the seam where the two biggest pieces come together. The seams between rubber castings will be filled in with Sculptamold, which was dyed with black paint as it was being mixed. The Sculptamold is mixed to a thick, lumpy consistency similar to cookie dough, and pushed into the seams with a finger or a small spatula. There's no need to worry about matching the details on the surrounding rubber castings. If you make your joints at low spots on the outcrop, they'll be nearly invisible anyway. You can use any other filler you like: regular plaster, body putty, paintable caulk, or anything else that doesn't react with latex rubber.